While it looks the same circa 2016, the functionality is much different. The stuff like "leave a message" and "dictate to IRC" aren't really relevant so much. Though it would be pretty cool to "dictate a message to groupchat". Another idea is to make an Intercom that allows someone to pick up the phone and speak out of the speakers in marry poppins. 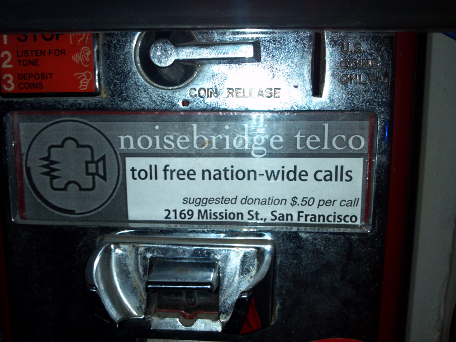 "toll free nation-wide calls" is hilarious and should remain. 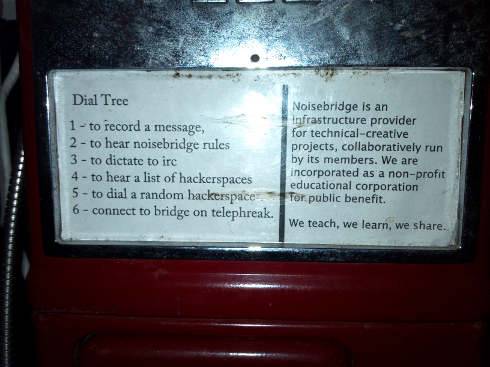 An awesome old red payphone was serendipitously discovered abandoned on Grand Avenue in Oakland. Our local hero picked it up and brought it to the space. The date of manufacture seems to be a very scribbly Aug. 1988. It is completely missing the coin counting and collecting mechanism. The keypad and hang-up switch look intact. The metal buttons on the outside actually just press against a standard little plastic keypad on the inside. The headset is not connected to anything, but terminates in four red, black, green and yellow wires that can be hooked up to a standard RJ11 (normal phone jack) connector. Out of the keypad/hang-up switch part there is a DB15 connector, equally hooked up to nothing. 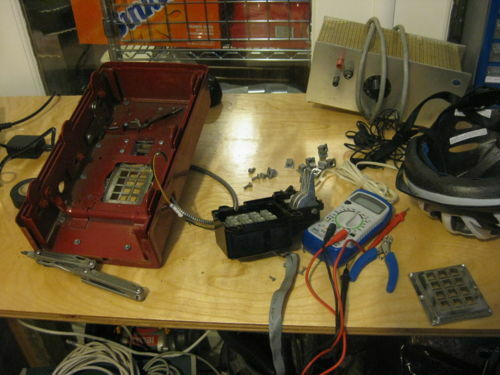 The assumption is that both this and the headset were connected to the coin counting mechanism which was the brains of the operation. We'll likely need to gut another phone for some missing parts, but how much surgery is needed will depend on what that DB15 connector can do for us. For that, we need someone to find a schematic for the pins, or someone who is a master reverse-engineer. If that's you, get to work! We decoded the standard schema for DTMF that seems to apply at least to both the gutted landline phone and the payphone internals, and determined the pinouts for both the relevant bits. It turns out, a button on the keypad doesn't simply close a circuit to make a pin hot, it activates two pins, which then correspond to inputs on the DTMF encoder chip. In other words, Dual-Tone doesn't just mean the tones that are output, it also applies to the signals inside the phone circutry. Neat! So now we can connect the output pins from the payphone keypad to the DTMF inputs on the landline guts. Seth is (I think) planning on bringing in a db15 breakout box in order to manifest this. Please no one break it further before we get a chance to do so. We figured out the order of wires for the headset to operate, corresponding to the (somewhat arbitrary) aligator clip => rj11 cable we made for the purpose. We got this to connect to the guts of a functioning landline phone, and got a dialtone from the VoIP box, as well as a functioning mic. This mapping is complicated to format on the wiki, it's written on the inside of the old headset in sharpie. That counts as documentation. The phone cable is connected to a Wildcard TDM410P in Pegasus which runs inside Freeswitch with some software drivers. I actually took more pictures but I strangely had a "Memory Card Error" (GRR!) and these were the two I recovered. Post more if you got 'em. This page was last edited on 9 July 2016, at 04:30.